The HP Photosmart D7360 was pretty self-explanatory and easy to navigate. It followed commands, albeit sometimes slowly, and the menus are clear and graphically appealing to the eye as well as easy to direct. Wireless use of the printer was also simple after it was configured and it made printing a hassle free experience. But printing large images is unacceptably slow. For $124.99, the HP Photosmart D7460 is a good value if your main interest is in printing documents and small photographs. The inks are reasonably priced and the value-packs are definitely a plus. But the low price might be a false economy if you are looking to print large photos; you'd be better off spending a bit more on a faster printer. 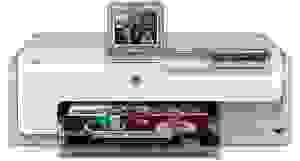 The HP Photosmart D7460 was definitely taken down by the Epson Stylus Pro R400 and the Canon Pixma Pro9000 in the photo speed test and again by the Epson Stylus Pro R400 in the DMax test along with the Epson PM240, but the HP D7460 was also beat out in the power usage section. As far as speed and color accuracy go, the HP D7460 barely improved on its own predecessor the HP Photosmart A440.